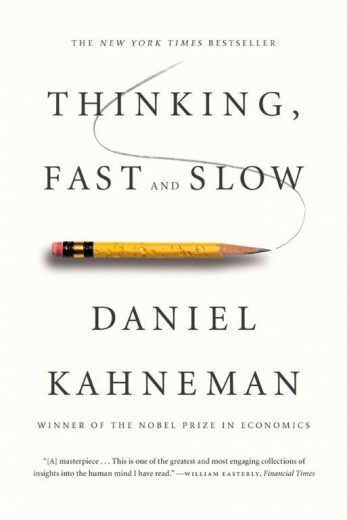 In Part Five: Two Selves, Kahneman describes the experiencing self as an example of the fast, intuitive, unconscious mode of thinking that operates in the present moment, focusing on the quality of our experience IN our life – living life rather than thinking about it. The remembering self is an example of the slow, rational, conscious mode of thinking that tells the story of our experience, how we think ABOUT our experience. Kahneman says each moment of the experiencing self lasts about 3 seconds, most of them vanishing without a trace. What gets remembered by the remembering self are changes in the story, significant (intense) moments in the story, and the ending. I.e., our brain tends to color the entire story with the intensity of the ending of it. For example, when someone listens to a symphony, and hears absolutely glorious music and at the very end of the performance, there is a dreadful screeching sound, someone could think/feel/believe the screech ruined the whole experience. But it hadn’t. What it had ruined were the memories of the experience. You have had the experience. You have had 20 minutes of glorious music. They can count for nothing if you are left with a memory that the performance was ruined. The memory was ruined, and the memory is all that you get to keep. The tricky part is, we make decisions, all the time, based on memory – the remembering self – rather than actual experience – the experiencing self. In one particular pain study, group A participants were subjected to mild pain for longer than group B participants, but experienced a gentle ending to the entire experience. Group B participants experienced pain for a shorter amount of time but the experience was spiked by more pain at the end. Participants from both groups will choose to experience more pain for a longer amount of time if they can avoid the spike, thus the “bad” memory at the end. Kahneman’s research is reflecting the power of the negativity bias of the brain: that we are hard-wired to remember intense, negative experiences more than positive, subtle experiences, even if the positive subtle experiences are most of what our days consist of. Essential for survival; not necessarily a reliable guide of what will bring us happiness and well-being in the long run. The relevance is we can often feel very different about a life, a vacation, a marriage than we feel while we are living it. Declining health at the end of a life may distort our perception/memory of the entire arc of a life. Losing our wallet at the end of a vacation can shape decisions about future vacations, even if most of the entire vacation was just fine. An acrimonious divorce can infect the memories we have of most of a good enough life together. An exercise to explore the complexities of these two selves would be to notice, simply bring to awareness, moments of decision when we can see we are reacting to the worst part of the memory of a story, dropping from consciousness the reality of the rest of the story. We do tend to focus on the one critical remark made in a business meeting or at a holiday dinner, rather than being able to hold on to the generally satisfactory nature of the entire experience. We can remember the most dreadful moments of a vacation or an argument with a spouse, and lose sight of the larger context. The advice of M.J. Ryan is pertinent here: to ask in any situation where things have gone kerflooey – what’s right with this wrong? Not to overlook or dismiss what went wrong and the need to show up and deal with it, but to not lose the bigger picture in the process. Especially to be able to remember the good or satisfactory moments that can nurture us and keep us going, even as we’re dealing with disappointments and difficulties. May your practice of noticing and taking in the good of the actual positive experiences of your experiencing self help guide you in decisions about what will make you happy and fulfilled in the long run.